Noble Jockey has been a leading supplier of racing supplies all over the world for over 40 years. Noble's is now manufacturing fully sublimated Win sheets. These are custom printed with your logo fully covering the entire blanket. They make beautiful award blankets. 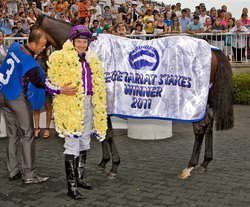 This picture from the Arlington Million-2011. 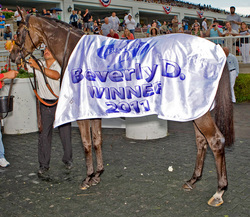 Below are the winning blankets for the Secretariat Stakes and the Beverly D at Arlington Park. We do all our embroidery and digitizing in house so we have full control of the quality. Also, all of the garments Silks, Saddle towels, blinkers and helmet covers are custom made and designed.